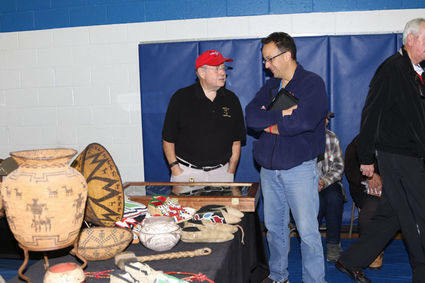 The Badger State Archaeological Society holds its Annual Native American Indian Artifact Show in late October on a Sunday. The event will be held at the Rehmstedt gym in Monticello School, 334 South Main Street, Monticello, from 8:00 a.m. to 3:00 p.m. Cost of admission is approximately $2.00 for 14 years and older. The show was started by Ralph Hammerly with only five tables in Monroe. The show has grown to over 80 tables of artifacts on display or for sale, including points, stone, bone, copper artifacts, Eskimo items, prints, books, pottery, jewelry, rugs and a whole lot more. The show itself is a history lesson, and there will be experts on hand to identify your artifacts. The Boy Scout Troop #106 will have a lunch stand. Awards for Best of Show, Best Personal Find, Judge’s Choice, and Best Educational Display. For more information, contact Steve or Janet Gobeli at (608) 329-4781.